Rod Hannifey is back on the highway promoting trucking after his employer stepped in to support the industry advocate with a brand new vehicle. Dubbo-based Rod Pilon Transport has handed Hannifey the keys to a Kenworth K200, giving him the chance to continue his efforts to lift the image of trucking and score a better deal for the sector. 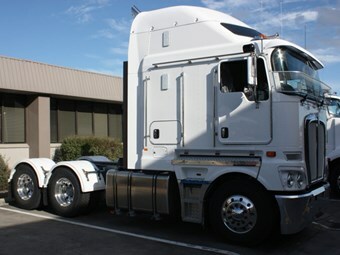 Hannifey previously used a prime mover on loan for a set period from owner-driver Ken Wilkie. Pilon donated the trailers, which are adorned with safety and promotional messages. Dubbed the Truckright Industry Vehicle, the prime mover was handed back to Wilkie last year after Hannifey could not raise the necessary funds to buy it. The K200, which has only just begun roaming the nation’s highways, will give Hannifey the ability to again attend industry events and take politicians, bureaucrats and business leaders on trips to give them an insight into the life of a truck driver. The Dubbo native used the trips in his previous vehicle to point out the lack of acceptable rest areas, poor roads and some of the dangerous on-road behaviour truck drivers must grapple with on a daily basis. Hannifey says he plans to use the new truck to attend at least one event a month or organise to have one person travel with him. He is still applying the finishing touches to the new Truckright Industry Vehicle, such as designing the curtains on the trailers and organising a new set of wheels. "I said to Rod [Pilon] I will support this for the next four years. We might do it again, but one thing at a time," says Hannifey, who plans to have everything completed on the truck in the next two months. Hannifey says it has been "a frustrating 12 months" in trying to secure a truck and gaining the necessary support to keep his work going. "I kept at it and at it," he says. Hannifey is well known for his tireless efforts in promoting the industry and is the Australian Trucking Association’s former owner-driver representative. He is responsible for the installation of roadside blue reflectors, which notify truck drivers there are unmarked rest areas or places ahead to pull over.